Football has been an immense source of pride in the McCaskill family and Ty McCaskill is keeping the legacy going on. 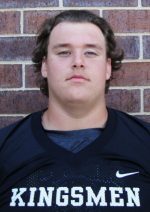 McCaskill, a towering presence at 6-foot-6, 310 pounds, recently committed to Illinois State to continue not only his academic career but also his football career. “The atmosphere of the games there are awesome and the campus all-around was just a good fit for me,” McCaskill said. McCaskill’s father, Penn assistant football coach and ex-Penn player Jeremy McCaskill, and his older brother, former Kingsmen force Payne McCaskill, have taught him more then just playing football, they’ve taught him what it takes to become a leader on and off the field. With both his brother and dad being on the offensive line they taught him that you have to trust the people next to you to do your job and that you will also do your job to become a better line together. Throughout the season, the Penn offensive line has gone through a lot of injuries, including their starting center, Mitch Bernard. Left tackle Tate Johnson has also missed significant playing time. But that that didn’t McCaskill and the offensive line from doing their job. Everyone who has needed to has stepped up and they are bringing that mindset into the playoffs – just trust the guy next to you. McCaskill said that the coaches are big part to Penn’s success. “It shows that the coaches really care about you, and that everyone is a family and helps each other,” McCaskill said. Penn is now looking to take that mindset into the playoffs and complete their ultimate dream every year a State Championship.